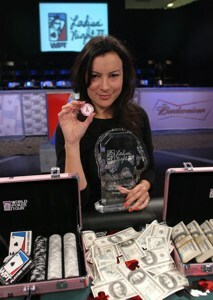 Jennifer Tilly Wins World Poker Tour LADIES NIGHT III To Capture Back-To-Back Women's Championship Poker Titles. The stunning achievement for a player who only began playing poker a year ago, is like an amateur boxer winning two heavyweight titles. The actress is the first woman to hold both of these prestigious titles in women�s poker. The victory earned her a seat in the $25,000 buy-in WPT Championship next April at Bellagio, and a specially-created pink poker set with the WPT logo and Breast Cancer ribbon. The WPT and the Bicycle Casino will donate $10,000 to Breast Cancer Research in honor of Tilly and the other competitors at the Final Table. Tilly began her pilgrimage to poker eminence by first playing in the WPT Hollywood Home Game series. She then played in the WPT Invitational event which annually pits celebrities versus professionals. There she met Phil �The Unabomber� Laak, a top player who would go on to win that event. They began dating several months later, and she took up the game under his tutelage. Responds her boyfriend, known for his ultra-competitive style of poker and the hooded sweatshirt he wears at the table, �What can I say? I hate to lose even to my girlfriend.� But he said it with a grin. The other competitors included defending Ladies Night Champion Isabelle �No Mercy� Mercier�a fiercely competitive French Canadian lawyer-turned-poker pro; Marsha Waggoner, the Grand Dame of Poker with 30 years of experience; Cecelia Reyes Mortensen, up-and-coming pro and wife to WPT champion Juan Carlos Mortensen, and Aidiliy (Lilly) Elviro, an aggressive new player, and one of the WPT Season III�s top woman competitors who is coached by her soon-to-be-husband, WPT champion Michael �The Grinder� Mizrachi. WPT Ladies Night III will air Saturday, Octobet 22 at 8 PM ET/PT on the Travel Channel. On the night the show airs, poker fans will be encouraged to supplement the Ladies� Night donation to Breast Cancer Research by purchasing a WPT Ladies� Night commemorative gift from the WPT webstore at www.worldpokertour.com. The choices, which will remain available on the site for several weeks and will include a specially-designed WPT/Breast Cancer Ribbon necklace by Roberto Martinez, with a portion of the proceeds going to the cause. The WPT is the league that launched the poker phenomenon when it first aired on the Travel Channel on March 30, 2003, and it continues to lead the way in developing poker as a major international sport.